AMC's Great Kids, Great Outdoors: Is Your Playground Breeding Nervous Wimps? Is Your Playground Breeding Nervous Wimps? Today’s playgrounds are so safe that kids find them boring, according to a recent study in Pediatrics. Equipment meant to reduce injuries may actually be reducing physical activity, and thereby boosting childhood obesity, claims a related article in The Atlantic. Boring playgrounds may also be creating more fearful youngsters, psychologists tell The New York Times: Without enough opportunities to achieve mastery over physical challenges, children may become more anxious—or they may seek thrills in more dangerous settings. This is, of course, bad news. 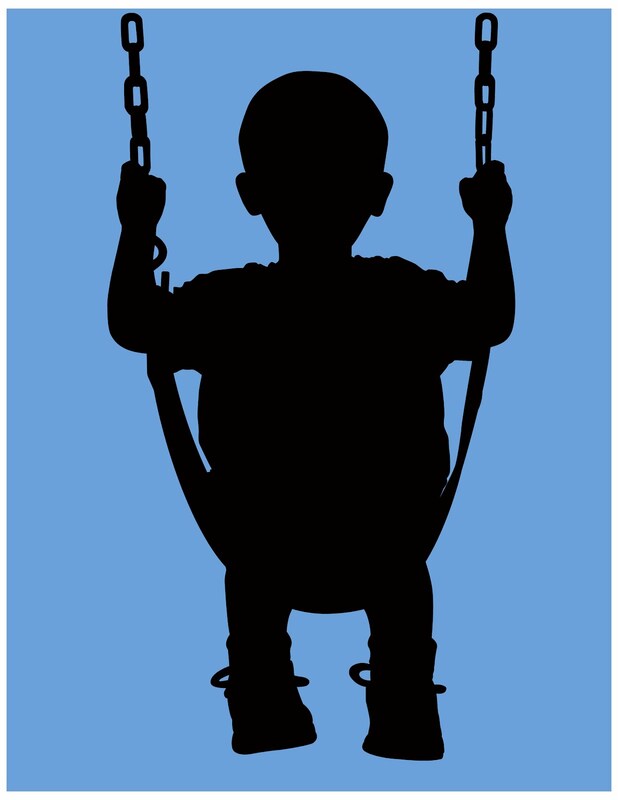 We don’t want to raise a generation of obese, risk-averse couch potatoes, or send kids from overprotected playgrounds to less safe play spaces. But some people seem to think the solution is simply to go back to the days of sky-high jungle gyms and head-banging teeter-totters. My guess is that the challenge is more complex. Safe does not have to mean boring. And fun does not have to mean dangerous. Active childhood play also doesn’t have to rely on static playground equipment. My 2-year-old will spend some blissful moments in a swing, but then is off inventing other games with sand, water, and toys (from cars to kitchen sets) that other families leave behind in neighborhood parks. The research study itself (which focused on day care centers) didn’t put all the blame on equipment. It found that parents and staff at the centers weren’t encouraging more active play because of concerns about injury, financial constraints (which limited the purchase of interesting play structures), and a focus on academics. 2. 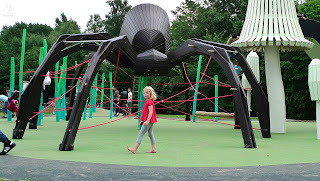 Creating more fun, interactive playground equipment that is safe, but engages the imagination. One approach is to build playgrounds with many “loose parts” that children can move around; another is to feature more inventive shapes that inspire role-playing and storytelling (like the work of Danish playground design group MONSTRUM, which includes the spider structure pictured here). 3. Creating natural schoolyards that invite exploration, making soil, plants, water, and other natural materials the focus of the play space. The playscape AMC is building at the Highland Center is one example of this movement. 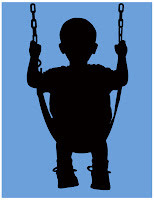 Of course, swings and slides will likely still have a place in playgrounds, and in encouraging children to get outside. They’re certainly popular with my daughter, who isn’t old enough to know the word bored. But to keep children engaged in the outdoors, we need to provide time and support for more creative games and interaction with nature. Illustration: iStock. Photo: Courtesy of MONSTRUM.